To those just learning their way around Newford, the magical east coast city where most of Charles de Lint’s stories take place, Dreams Underfoot is a great tour guide. The stories in it span from the derelict tunnels of the subterranean Old City to the artsy district of Lower Crowsea. You put it down feeling like you’ve lived there yourself, like you’ve admired Jilly’s paintings in a gallery or a coffee shop, glimpsed Paperjack telling fortunes in the park, stopped and listened to Geordi busking on a busy downtown street. Having grown up on a dairy farm in eastern Washington, the idea of Newford itself seemed about as magical as anything else in De Lint’s world. To this day, I still have a romanticized view of cities from it. The hills of Yakima just can’t compare. It’s hard to even list the ways this book has influenced my life. It was my first introduction to mythic fiction, the genre I prefer to read (and write) in. But it also introduced me to Celtic music, to a great many folk tales, to cowboy coffee, and to an aesthetic I still hold dear. As a writer, I think I spent more of my early formative years trying to learn from Charles de Lint’s prose than from any other author’s. Dreams Underfoot is the reason I wore a faerie necklace in high school, the reason I’m fascinated by underground spaces, the reason I’ll occasionally give money to panhandlers, the reason I still try my best to dress as Meran Kelledy. Hell, maybe it’s part of the reason I went on to marry my musician husband. 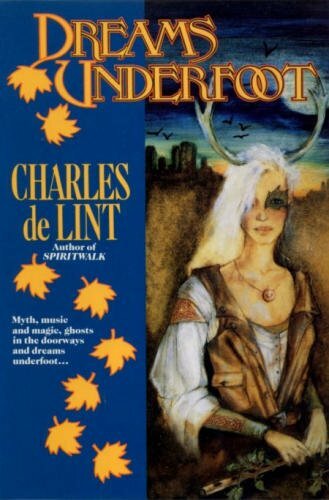 It (and the rest of Charles de Lint’s work) influenced me so deeply, at such a formative age, that it’s hard to tease the traces of it from the tangled threads of my personality. To this day, I still half-imagine Newford as a second home, the city I visited with my heart, if not my body. Thank you so much for your kind comment. I almost died when I saw your name in my inbox! You and your husband are both so inspiring — I love the artwork you’ve posted on your website, by the way. I’m so surprised and pleased that you found my fledgling blog. Thanks again!